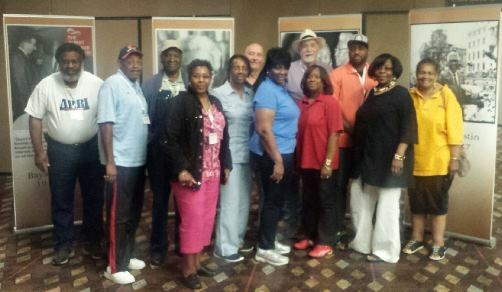 IAM General Vice President Diane Babineaux, red shirt, is joined by a delegation of IAM members at the 45th National A. Philip Randolph Institute Education Conference in Reno, NV. 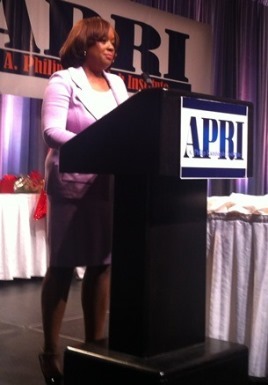 IAM General Vice President Diane Babineaux received the “Rosa Tucker Award” at the 45th National A. Philip Randolph Institute (APRI) Education Conference in Reno, NV. IAM General Vice President Diane Babineaux received the “Rosa Tucker Award” at the 45th National A. Philip Randolph Institute Education Conference in Reno, NV. APRI’s “Rosa Tucker Award” is the organization’s highest honor. Tucker, born in 1881 and the daughter of a former slave, was the founder and first Secretary-Treasurer of the International Ladies Auxiliary in 1937. The Auxiliary organized the wives of the Brotherhood of Sleeping Car Porters where Tucker had worked with its founder, Asa Philip Randolph. The Auxiliary was instrumental in supporting the Pullman Porters in their successful effort to organize a union and improve wages and working conditions.